The exhibition ‘Making Faces’ was set up to ‘explore the face, the body, the self and the disjuncture between what is seen and what is felt’. Situated in the bustling Southbank of our capital it is a powerful public expression of honesty and hope. The Submit To Love Studios, based at Headway East London in Hackney, is home to a collective of self-taught artists who share a single life experience; all have survived an acquired brain injury. This unique exhibition showcases the talent as well as the insight of these artists, as a way to make sense of their experiences. The mix of contemporary, almost life-size portraits on 3D cardboard boxes, more traditional mounted images, and the range of artistic techniques including painting, collage and printmaking, reflects a diversity of styles to represent a diversity of experiences. On first impression, the vibrant colour gives rise to an uplifting sense of creative expression. Delving deeper into the detail, the rawness of human emotional experience is revealed through words embedded in the images. There are stories of 'darkness' and loss. One artist writes 'My life has been shattered into a million pieces'; and another that 'I’ve been feeling confused about life. I mean I need to be doing more with it. I’m married. I’ve got a lot to take on. I’m in a chair. I cannot talk and that makes it very hard to be understood'. The sadness of how others respond is also captured: 'People go through hell. They get called names'. The exhibition does not shy away from the sometimes-harsh reality of living with a disability. Yet alongside this, is a message of optimism and strength for these artists and their families. 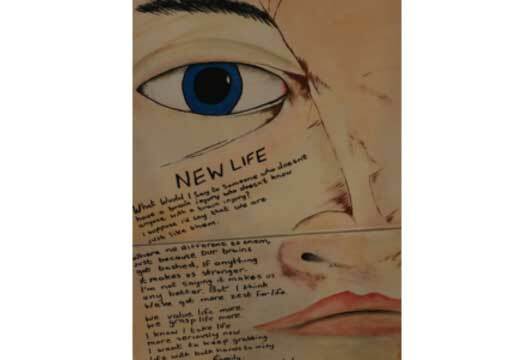 In the image shown above, the artist speaks of living a 'new life' that is highly valued and taken more seriously; in their own words, 'it makes us stronger… I want to keeping grabbing life with both hands'. One collage is dedicated to the challenges and passionate spirit of parenting after experiencing a brain injury, with the words 'I proved them wrong!' in prime position. Another recounts one artist’s happiness in getting married after a 'hit and run' road traffic incident. The sense of coping in spite hurdles thrown in by life leaves a powerful impact on the passing observer, one that is enhanced by listening to the audio recording of an interview with two of the artists from the exhibition, where they debate questions of a philosophical nature about what art is and what it means to them. Billy, who was a journalist before experiencing a stroke, talks about how creating art has inspired him to share and teach others art too. Being from a background in Clinical Psychology, and working in Neurorehabilitation services to support people through periods of emotional distress after experiencing an acquired brain injury and conducting research to better understand this, I was particularly struck by the messages portrayed in this compact and poignant exhibition. Models of psychological adjustment such as the ones described in thought provoking books such as Tamara Ownsworth's Self-identity after Brain Injury, emphasise the importance of considering a ‘self-system’ comprised of multiple identities, be it one’s past self, one’s current self or one’s possible future self. The value of social identity, one’s group membership and one’s roles in life, as well as the ability to participate in activities that provide meaning and purpose (as a partner, as a parent, as a journalist, or as an artist or teacher, perhaps), are major parts of this. Other thinkers in this area have suggested that acceptance of a new identity and active attempts to cope with challenges may be routes to finding hope and well-being after a brain injury, with some finding that difficult experiences bring newfound personal growth. In holistic Neuropsychological models, the effect on the wider system surrounding the person who has experienced the brain injury is not forgotten. This exhibition validates these theories but also highlights the importance of listening to the first hand experiences of people affected by a brain injury. Whilst one person wrote, 'You have to surrender and accept where you are' and posed the question 'why do I feel like I’m not who I was anymore? ', the message from another person was quite contradictory and clear 'I’m still the same person'. The need to consider every person as an individual, coming to term with their experiences, in their own way, is still there. The idea that artistic expression can support this process is not a revelation, to me at least, but a reminder that there is value in thinking more creatively about meeting the needs of people who have experienced a brain injury. Submit To Love Studios offers an opportunity to embrace the role as an artist and explore self-identities as part of a community that feels safe and welcoming. In their audio interviews Chris and Billy spoke of coming back to Headway for years, a true testament to the significance of their work. This exhibition was a wonderful chance gain a glimpse into this and, I hope, the start of more to come. The ‘Making Faces’ exhibition runs until 23 August 2017 at the Southbank Centre in London.